1. I can vividly recall some folks rudely walking out. 2. Sue ran out of time, and I remember being quite disappointed because I wanted to hear more. 3. I recall feeling like I wasn’t alone and that I wasn’t crazy for how I felt and made sense about experiences I’ve had. These thoughts and feelings led to me placing Sue’s book in my Amazon cart for future reading, which I just so happened to find time to do over the last week. 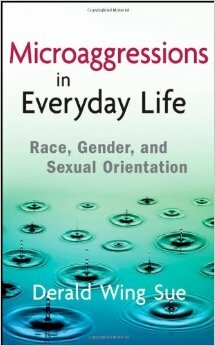 Microaggressions, according to Sue, “are constant and continuing experiences of marginalized groups in our society; they assail the self-esteem of recipients, produce anger and frustration, deplete psychic energy, lower feelings of subjective well-being and worthiness, produce physical health problems, shorten life expectancy, and deny minority populations equal access and opportunity in education, employment, and health care” (p. 6). Sue goes on to discussed the negative impact of built up microagressions throughout one’s life. Although I read the book due to my own personal interests, I couldn’t help but consider if there is a way to include at least exerts from it into my classes (I’m still considering this). Most powerful to me were the narrative examples that Sue shared from his research. I also found the book powerful because it caused me several times to consider counterarguments and then to question where such arguments came from, as well as why they came so easily. For example, when Sue discussed health impacts of microaggressions to various marginalized groups, I found myself wondering how he knew that the negative health issues were connected to microagressions. I could think quickly of numerous explanations for such negative health concerns that aren’t about microagressions–or so I thought until I continued thinking about it. I had to work to spend time considering the connections to microaggressions that Sue was discussing…at least a bit harder than it took to think of all the numerous explanations. I had to work harder despite connecting personally to several of the types of microagressions he discussed. For example, when I thought “oh, no that could be due to not eating healthy”, I then thought about all of the systems and structures that don’t make choosing to eat healthy as simple as choosing to eat healthy. I felt stretched through this process, and appreciated the book for providing such an opportunity. This isn’t to say that I necessarily agreed with all that Sue asserted (I’m “sitting with” much of it still), but I did find it worthwhile to consider. One of the biggest overall takeaways for me was when Sue stated, “the most disempowered groups have a more accurate assessment of reality, especially related to whether discriminatory behavior is bias-motivated” (p. 47). This statement caused me to pause, and although it was provided early in the book (and repeated several times thereafter in a variety of ways), I’ve continued to spend time reflecting on it and what it means for my practice. I can’t help but wonder what the world would be like if such a statement was deeply believed by all. This entry was posted in faculty, higher education, student affairs, Uncategorized and tagged Derald Wing Sue, faculty member, higher education, marginalized groups, microaggressions, student affairs, student affairs practitioners, student affairs professionals. Bookmark the permalink.